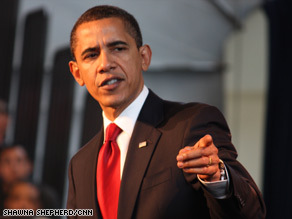 (CNN)--President Obama travels to Mexico on Thursday as the country deals with a violent surge in drug crimes. Obama recently announced a crackdown on border violence and on the smuggling of cash and weapons into Mexico -- a step that could mark an end to a blame game over where responsibility for the violence lies. The president recently designated three Mexican organizations, which he says are involved in drug trafficking, to face hefty financial sanctions under the Foreign Narcotics Kingpin Designation Act, White House Press Secretary Robert Gibbs said Wednesday. The law, signed by President Bill Clinton in December 1999, authorizes the president to impose penalties against foreign drug kingpins -- and organizations that do business with them, according to the Treasury Department. "Today's action underscores the U.S. government's support for [Mexican] President [Felipe] Calderon's courageous attack on the cartels and our attempt to attack the financial underpinnings of Mexico's cartels believed to generate billions of dollars annually," Gibbs said. The president's action comes ahead of his trip to Mexico -- along with attending the Summit of the Americas in Trinidad and Tobago later this week -- where drug violence will undoubtedly be debated. Obama lauded Calderon as having done "an outstanding and heroic job in dealing with what is a big problem right now along the borders with the drug cartels." Authorities on both sides of the U.S.-Mexico border blame powerful drug cartels for escalating bloodshed. Analysts have said the bulk of the violence takes place along the U.S. border, particularly in Ciudad Juarez, Chihuahua and Tijuana -- as well as on Mexico's western coast. Obama vowed that the United States can be counted on to help. "We are going to be dealing not only with drug interdiction coming north, but also working on helping to curb the flow of cash and guns going south," Obama said. The American public, meanwhile, is divided over Mexico. Fifty-two percent of Americans have a favorable opinion of Mexico, according to a CNN/Opinion Research Corp. poll released April 7. Forty-six percent have a negative opinion. The poll was conducted April 3-5 and has a margin of error of plus or minus 3 percentage points. Despite those numbers, the Pentagon and the director of national intelligence have both warned recently of the national security threat that an unstable Mexico poses. Congress also has addressed the violence, holding eight hearings since coming back into session two months ago. Former Mexican President Vicente Fox on Wednesday downplayed analysts' warnings, saying the worst-case scenario is "far, far, away." As for who is to blame for the surge in drug cartel violence, Fox refused to point fingers, saying both sides share responsibility -- Mexico, for its role as a producer and transshipment-shipment point for illegal drugs, the United States for its insatiable appetite. Some of the sources of the violence are on the U.S. side of the border, Mexico's ambassador to the United States, Arturo Sarukhan, said on CBS's "Face the Nation" Sunday. "You need 'two to tango.' And as Mexico seeks to shut down the flow of drugs coming into the United States from Mexico, from South America, we need the support of the United States to shut down the flow of weapons and bulk cash," he said. Sarukhan called the Obama administration's willingness to accept co-responsibility "a very encouraging sign." "I think that the fact that the Obama administration is seized with the importance of this issue is a clear indication that they understand that, to defang the drug syndicates in Mexico, we have to eliminate two of their most powerful sources -- bulk cash from the United States into Mexico and illicit weapons." It's a point with which Secretary of State Hillary Clinton agrees. "Our insatiable demand for illegal drugs fuels the drug trade," she said on March 26. "Our inability to prevent weapons from being illegally smuggled across the border to arm these criminals causes the deaths of police officers, soldiers and civilians. So, yes, I feel very strongly we have a co-responsibility." During her trip to Mexico, Clinton emphasized that the United States has already appropriated $700 million in aid to Mexico, and Congress wants to see how the administration is applying it before sending more. Sarukhan said Clinton's visit to Mexico in March -- along with other top administration officials -- has "started to push the ball in the right direction." But Sarukhan warns that the key issue right now is how the United States can help crack down on guns and cash flowing to the Mexican drug cartels. "We have seen a dramatic rise of assault weapons being seized in Mexico. There's a direct correlation between the expiration of the assault weapons ban and our seizures of assault weapons." Despite the violence, Mexican officials say the country is safe and that tourist areas -- such as Cancun and Acapulco -- have a large security presence. In a speech in mid-March, Calderon said 93 percent of the 6,500 deaths attributed to organized crime in 2008 occurred among the criminals. Most of the rest were law enforcement authorities, officials have said. Few civilians are killed, the president said. In that same speech, Calderon ridiculed those who say Mexico is unsafe. "It is absolutely false, absurd, that anyone indicate that Mexico does not have control over one single part of its national territory," he said. "I challenge anyone who says that to tell me what part of the country they want to go to and I will take that person there." Kathleen Kennedy Townsend, who serves on the board of the Brady Campaign to Prevent Gun Violence, said in a recent CNN.com commentary that the United States needs to examine gun control in order to tackle the violence in Mexico. "While the Mexican drug war has the media and Washington abuzz, there has been little mention of our role in supplying the terrorists: We need to realize that the Mexican drug cartels are arming themselves here because our gun laws have loopholes so large that criminals and gun traffickers can easily drive gun-laden trucks through them," wrote Townsend, a former lieutenant governor of Maryland and daughter of the late Sen. Robert F. Kennedy. But in an opposing commentary on CNN.com, National Rifle Association President Wayne LaPierre argued that a crackdown on guns in the United States won't -- and should not -- be the answer. Instead, LaPierre argues, the United States should simply "seal the border. Punish the guilty. And use existing gun and drug laws against violent drug syndicates here and in Mexico." "But leave American freedoms alone," he added.